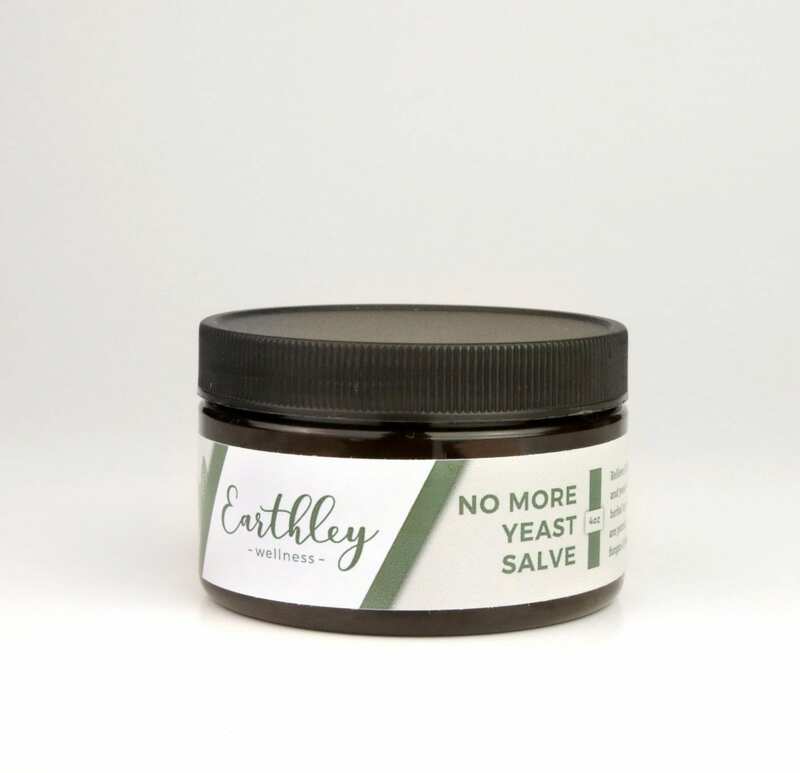 A yeast infection of any kind is very uncomfortable — get rid of yeast and itchy fungal rashes fast, with our No-More-Yeast Salve! Our natural yeast remedy is safe to be used for the whole family because we never use fragrances, parabens, sulfates, or polysorbate 80. Find relief with our all-natural topical yeast infection remedy! Yeast Issues Got You Down? Not Anymore, With No-More-Yeast Salve! Use to get relief from athlete’s foot, jock itch, female yeast infections, thrush, and more. Formulated to be safe for the whole family to use. Lots of people deal with yeast overgrowth which can cause a variety of issues including athlete’s foot, jock itch, female yeast infections, thrush, and a whole lot more. Yeast overgrowth is common because of the amount of sugar in our modern diets, and lack of probiotics to balance it out. But that doesn’t mean you have to suffer — or change your whole life overnight. Instead, address that yeast topically, and quickly, with No-More-Yeast Salve! What Makes No-More-Yeast Salve So Effective? In Earthley’s natural yeast remedy we’ve used some of the most powerful, yet gentle antifungal oils and herbs to help combat yeast naturally. These oils and herbs for yeast infections work without disturbing your gut flora, so you’ll actually feel better — and less itchy — without side effects that other yeast infection products can cause. It’s even safe enough for most babies and kids, so you can use it for the whole family. Get rid of the yeast, naturally and finally find relief! If you are looking for the best remedy for yeast infections, you’re in the right spot. Buy Earthley’s No-More-Yeast Salve for jock itch relief, natural thrush remedy, and female yeast infection relief! Rub a small amount on yeast rashes as needed. Shelf Life: 1 year. For topical use only. Safe on babies 6 months and up in small amounts, as well as for pregnant/breastfeeding women. Do not allow ingestion. This is a miracle product , truly. The smell is intense and not like all my other yummy smelling products from Earthley. It is the neem oil that is the culprit I am sure. Probably best used at night, the smell dissipates and is well worth the results! This is a life saver! My daughter had a terrible diaper yeast infection and this salve cleared it almost completely overnight! It has a very strange smell thats alittle hard to get past but trust me that you will once you see how it works! Haven’t needed to use this yet, BUT I’m happy it’s in my medicine cabinet for the family. I’m glad I found a product that will work for everyone in the family and is organic. Never had to treat yeast before but now I have something that will treat it and a brand I can trust! That’s important! I have tried a lot of things for when my athletes foot flares up, the itching can drive me crazy! I am happy to report that with this the itching stopped almost immediately and with just a couple of uses it cleared up. The smell can be a little off-putting but it is so worth it! Works great. I just got this with my recent order. After using a conventional yeast cream with little success. My skin is so much better after just one use. I will say it does smell a little Luke burnt rice. This one smells a bit odd, but it worked oh-so-well to clear up my son’s yeast rash around his nethers & the crusty around the back of his ears. It is soothing & healing, and I’ve even used it on raw noses during colds! This has been a life saver for my toddlers foot fungus from his feet sweating so much. I put it on at night time when he has a flare up and it only takes a couple days to clear up! Got this for my daughter’s cradle cap that just wouldn’t go away. Coconut oil, scrubbing, etc didn’t help long term. The smell of this salve is kind of like weird onions so I put it on for an hour before bath time or right before bed. I only had to use it a couple of times and some light brushing for the cradle cap to disappear. Been a few weeks and still no cradle cap! My son has had a relentless fungal infection on his face for months that has stumped the dermatologists, despite several high doses of prescription meds. After a day of using this salve, I could see a noticeable difference in the severity of his rash, it’s appearance, and how much it irritates him. He complains about the smell, but if it makes him better, we’re willing to persist. Earthly hasn’t let us down yet!!! As someone who has struggled with chronic Candida, I was very anxious to give this salve a try… it has worked out great!!! I had external yeast in my belly button (eeew!!) and 24 hours after applying this salve, it had cleared! This has been life changing for our family! I have suffered from a fungal skin rash for about 15 years and nothing has worked; but this stuff is a miracle in a jar! My legs are rash free since about week 2 of everyday use!!! It also works for “personal” care. Yeast infections can be a drag, but just a little amount and it’s gone pretty much over night! Which helps when my daughter is in the hospital. I really like how well this salve works. Thankfully, I am familiar with using neem oil. I do find myself looking to see where the burned smell is coming from hours later. Aside from the pungent neem, this product works so well. I did try adding some tea tree oil, which combated the lasting power of the neem, and did not seem to compromise the effectiveness. I don’t know that doing so would work for everyone based on compounded sensitive areas being treated and the nature of fragile skins. Thanks earthley for a great product that does what it is supposed to do! Used this on rash on my leg which cleared up in a few days. One application on rash between toe made a very noticeable difference. It hasn’t totally cleared up after a week but except it to be gone soon. I was not overwhelmed by the smell even though I am very sensitive to certain scents. This product was a lifesaver! My 10 month old daughter had a yeast diaper rash for what seemed like forever. I tried a number of products and things like apple cider vinegar to no avail. Plus, the ACV dried out her poor delicate skin. Her doc prescribed an anti-fungal cream but I wanted to avoid that if I could. Enter.. No More Yeast Salve! Her rash looks a million times better! I was beginning to think it would never go away. Thanks Earthly! This product is amazing! I have dealt with dry, cracked heels for years (from athletes foot I believe) I tried everything, anti fungal medicines, creams, lotions, etc.. nothing has ever worked. My feet were so bad I was embarrassed to wear sandals or walk barefoot. I’ve only used this 4 days and my feet aren’t cracked or peeling. They are starting to feel soft again! I’d highly recommend it! Smells funky, but totally works! My husband was having some breakouts on his feet from being in hot, sweaty boots all day, and this helped out! He was definitely not pleased with the scent, haha, but it works! This stuff works – and fast. I use it on my toddler and baby. I do hate the neem oil smell, so I just apply it with a q-tip. I’m so happy we found this product as it has become our go to for fungal\yeast issues. I was really excited to have this on hand for my kids yeast diaper rashes. Sure enough, my 10 month old developed a yeast rash. I applied this every diaper change. It started looking better for 4-5 days and then I think the rash overcame it and the yeast rash got so bad and my son was so uncomfortable with it. We had to switch to traditional antifungal. I was super bummed though. Customer Service responded quickly and said they will refund us for the product. I keep this on hand for those diaper rashes you’re not quite sure if its yeast or not. I don’t want to use an OTC antifungal on my baby and I love that we can use this instead. The smell isn’t as awful as I was expecting by some of the other reviews. I had pretty much given up on finding a natural topical cure for yeast rashes. All the essential oils made my rashes angry that they had been disturbed. This stuff works! Stinky, but not worse than the pain of that awful rash! Now I don’t have to wait for the lifestyle changes to take effect before I can start feeling better. A terrible underarm reaction was calmed immediately with this salve! Also has been used on my granddaughters chemical burn from horrible toxic diapers we had to use in an emergency! Thank you for this product! I bought this cream almost a year ago, and honestly can’t remember why I did. So the cream pretty much just sat on the shelf. But not long ago I had a stinky, painful rash, that I get occasionally, especially in the summer, and it occurred to me that it might be a candida rash. I looked it up and sure enough, the rash definitely fit the description. So I pulled out this cream and tried it, and it was like a miracle cream, within 24 hours the rash, the pain, and the skink were completely gone. And since then, whenever the rash threatens again I just keep the area clean and dry and use this cream and the rash disappears. What a relief! My husband has struggled with a fungal infection on several areas of his skin for a couple years now. For a long time he used prescription creams and body washes, but they never got rid of the rashes, only “maintained” them. After reading about natural remedies, we wanted to try something with calendula in it. We found a couple other “natural” products that he liked better than the prescription products, but again the rashes never got very much better. Then he stumbled upon No More Yeast Salve while I was looking on the Earthley website for a different product. We ordered it and within a day of using it he saw significant improvement. The rashes are almost completely gone now. The smell is odd, but he was prepared for that based on other reviews. Application is also very easy, but it sometimes takes a while to dry on the skin. Other than the necessary smell, and sometimes having to wait a little while to dress completely after application, he’s absolutely thrilled with it. I’m also very happy to have looked through other reviews about this product. After reading others’ success with cradle cap and dry spots behind ears, I’ll be trying this on my daughter. Looking forward to see how it does! Thanks!